Purpose: A simple game that helps kids get to know each other. Great to play in the beginning of a semester or if you feel the class needs to better work as an ensemble. 1. 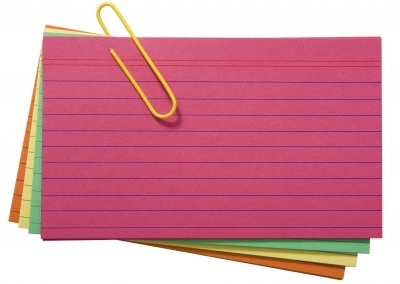 Give every student a blank index card. 2. Tell the students to write one thing that no one knows about them. 3. Collect the cards, shuffle them, then randomly hand one to each student. 4. The students must figure out who wrote the card, without directly asking. 5. Gather the group, have each student share how they figured it out. 1. Feel free to customize whatever you prompt the students to write on their card. 2. For example, you could have them write three things: favorite subject, favorite place they’ve ever visited, favorite song. 3. After each student finds the correct student who wrote the card, have them introduce themselves and tell them a little bit more about their choices. Have ideas for other prompts? Leave them in the comments below! Beat by Beat Press is passionate about inspiring kids through theatre. That’s why we create unique teaching drama resources and high-quality plays for kids to perform. An alternative, more for older kids: put together a list of information about a person (see prompts listed above) and have everyone copy the prompts on their sheet with their name on the top (without completing them!). The kids sit in a circle. Everyone gives their paper to their left neighbour, and fills out the first prompt on the paper they just got. They should try to find something matching for the person whose name is on the paper (even, or especially, if they don’t know each other). When the papers come back to their owner, let everyone in turn read their paper and compare with the answers they would have given themselves.